Small leaf tea, specially selected and blended for Waitrose. 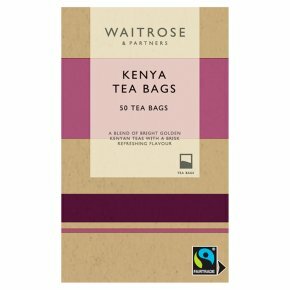 Kenyan tea is grown in the highlands either side of the Rift Valley, and is noted for its bright golden colour and brisk and refreshing flavour. On the back of the pack. How to make the perfect cup of tea. Place one teabag per person into a warned teapot or mug and add freshly boiled water, do not reboil. Stir, then allow to brew for 3-5 minutes before serving with milk, if desired.